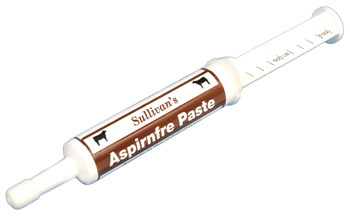 Sullivan's Aspirnfre Paste [AFP] : Highland Livestock Supply, Ltd, Products for all of your show animals! 32 ml tube - This all natural product assists in the relief of pain. Can be a benefit for animals that walk stiff. Does not contain any drugs so there is no withdrawal period or side effects. One tube works for animal up to 1000 lbs. Administer three hours before time of showing.